Helsinki Mills is a milling company owned by the Puhk family. The family’s roots are in Estonia, where they founded their first mill in the 17th century. In the 1930s the world economy was beginning to show signs of recovery but Finland continued still to be depended on imported wheat. Competition in the Finnish milling sector was extremely limited. The Puhk family saw a business opportunity and set about to expand into Finland. Eduard Puhk, the second oldest of the Puhk brothers, arrived in Helsinki to look for a place for a new mill. The suitable premises was founded by the sea in Sörnainen. Helsingin Mylly ja Kauppa Oy were founded at a meeting in Helsinki on 8 October 1934. The industrial premises underwent a renovation to allow the mill to begin operations by the following autumn. The new mill was the first and only one of its kind in Helsinki, with an output of tens of thousands of kilos per day. At the company’s helm was Eduard Puhk, who settled in Finland with his family. WWII began in 1939 and in June 1940 the Soviet Union occupied the entire Baltic region. 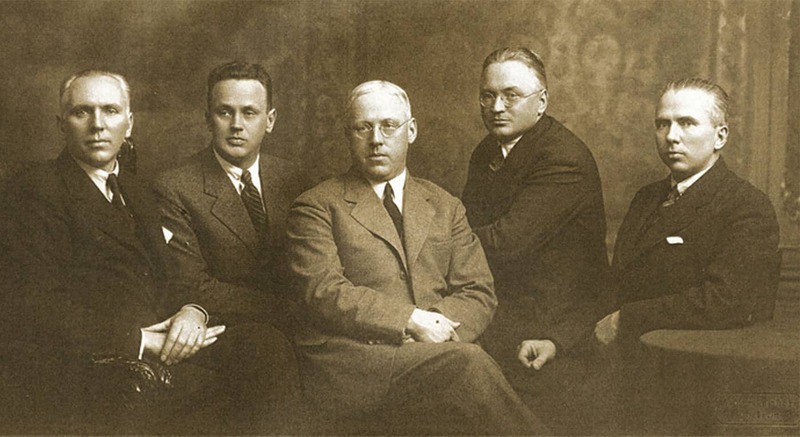 The Puhks’s assets in Estonia were confiscated and, by the autumn, all the brothers, with the exception of Eduard, had been arrested and sent to a prison camp in the Soviet Union. They were never heard from again. Devastated, Eduard never recovered and died in Helsinki in March 1943. Following his death, Gustav Gardberg, his key ally, took over the leadership of the company. It was around this time that an oat mill and the Matin Leipä Oy crispbread factory were built in Sörnäinen. In 1952, the year of the Olympic Games in Helsinki, the company name was shortened to Helsingin Mylly Oy. Eduard Puhk’s son Jüri assumed responsibility for Matin Leipä Oy in 1956 before becoming MD at Helsingin Mylly in 1964. In 1962, the Helsinki Mills milling process was completely redesigned. A neon sign, depicting Mylly-Matti, the chubby brand figurehead, representing Helsinki Mills’s flour products, was erected on the front of the Helsingin Mylly building. In the late 1960s, the decision was taken to focus on milling only. The new flour silos, completed in 1969, made production considerably more straightforward; the grain was milled directly into the silos and bagged later. The vans delivering flour to the local bakeries could now also be loaded directly from the silos. The decision was taken to discontinue the company’s crispbread production and Matin Leipä Oy, along with the demolished oat mill, was sold in the early 1970s to Vaasan Höyrymylly. In the late 1970s, the company launched the Mylläri home baking range. The first Mylläri product was the Myllärin Sämpyläjauho bread mix. New and unique, the flour mix was created with home bakers in mind and especially designed to lend itself to bread rolls. By the 1980s, the confined premises in Sörnäinen started to lack in space. Logistics were a challenge because of a rise in road traffic as well as the gradual dismantling of the local railway line, which would ultimately leave the mill cut off. In response, the decision was taken to sell the premises and look for a new base for the mill. Eventually, an excellent new location was found in Järvenpää, eastern Uusimaa, where the company’s new facilities were built. In 1992, construction work on the most technologically advanced mill in the Nordic countries was completed in Järvenpää. It remains the nerve centre of the company’s operations to this day. Soon after the inauguration of the new mill, another significant decision was reached and AS Balti Veski, an Estonian subsidiary, was founded in Tallinn. AS Balti Veski sold the Veski Mati products in Estonia and remained part of Helsinki Mills for more than two decades, before it was sold in 2015. The 1990s were a time of growth for the business. The Mylläri product range now incorporated a selection of cereal flakes, manufactured by our partners Oy Polar Mills Ab in Vaasa. By the mid-1990s, Oy Polar Mills Ab was looking for a buyer and on the eve of midsummer’s eve 1997, the majority acquisition by Helsinki Mills was approved at the company’s AGM. With the purchase, company’s own production grew to comprise cereal flakes and expanded to two agriculturally significant areas in Finland, the wheat farming area of Uusimaa and the oat farming area of Pohjanmaa. Today, oats are a key raw material for the company and the Vaasa unit has established itself as an extremely important part of the company. In 2015, the unit in Vaasa underwent a sizeable expansion that saw its output double. In addition, a section of the facility was dedicated to processing just oats, allowing Helsinki Mills to start producing gluten-free, pure oat products. In the autumn of 1997, the Myllärin brand received extensive publicity when it was awarded the Finnish food product of the year prize. The winning product was a rye bread mix created by our R&D team. Its popularity grew rapidly across the country and it remains a much-loved popular favourite to this day. The early 2000s marked a period of increasingly intense competition in the bakery and retail markets. In 2012, we decided to develop our brand and consolidate our market position. A root and branch brand review was undertaken in 2013 that saw our key message streamlined, packaging re-designed and product selection updated. The new slogan ”Puhtaasti parempaa jokaiseen päivään” (Pure and delicious every day) was, and is, the thread that ties all our operations together. Our re-launch proved to be a success, driving up consumer awareness, user numbers and sales significantly. A 2014 survey found that the Myllärin brand was seen by consumers as the most innovative and cutting edge cereal brand in Finland. The next significant development in Helsinki Mills’s history took place in January 2014, when the Board decided to acquire the Närpiö-based Oy Topfood Ab. The investment allowed us to begin the production of Finnish muesli and breakfast cereal products, to adopt new technologies and expand our product offering. With the acquisition, the well-known muesli and breakfast cereal brand Sun was added to our portfolio. There is currently a clear niche for breakfast cereals and mueslis manufactured in Finland. We updated the Sun brand and product selection in the spring of 2015 and the move has led to a huge rise the number of people using the products. Exports are a key strategic focus for Helsinki Mills. We have carefully built our export market over time and are pleased to see it achieving year-on-year growth. Helsinki Mills is Finland’s largest producer of organic cereal products and a significant exporter of organic oats. Today, exports represent as much as around 30 per cent of our total turnover. Helsinki Mills products, including flakes, porridge products, flours, baking goods, brans, breakfast cereals and biscuits and chips are now available in some 30 countries around the world. In Finland we are known as Helsingin Mylly and internationally as Helsinki Mills Ltd. Our organic oats range is particularly well known and demand for the our products is high on all continents – across Asia, Europe and the United States.